America’s First Amendment prohibits Congress from passing laws suppressing speech, press and religious freedoms – along with the right to peacefully assemble and petition government for redress of grievances. The same goes for NFL owners. Their announced policy on national anthem kneeling or sitting flagrantly violates First Amendment guaranteed free expression. Near-unanimously banning these practices, excluding the ruling from collective bargaining, San Francisco 49ers owner abstaining, subjects teams to fines if players or other personnel fail to show respect for what deserves none. Along with its flag, the national anthem represents an imperial state, waging permanent war on humanity at home and abroad, responsible for countless millions of casualties post-9/11 alone. Dissent is the highest form of patriotism. Last September, Trump disgraced himself by irresponsibly blasting NFL players – kneeling, not standing, during the national anthem, their legitimate right of dissent, and why not. There’s plenty to dissent about America’s rogue state policies at home and abroad. NFL players and everyone else have a constitutional right to protest peacefully against racial discrimination, police brutality, wars of aggression, social injustice or anything else. “I am an anti-imperialist. I am opposed to having the eagle put its talons on any other land,” harshly blasting ruthless US mass slaughter and destruction. It’s far worse today than then, including dismissiveness toward the nation’s most vulnerable, and repression of targeted dissidents, opposing Washington’s debauched system, its anti-democratic agenda, its contempt for rule of law principles, its governance of, by and for the nation’s privileged class exclusively. 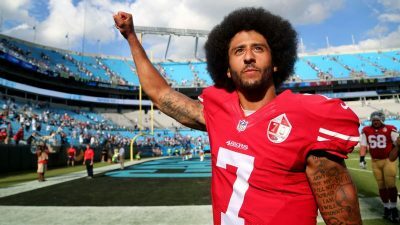 Former NFL quarterback Colin Kaepernick began what followed, dozens of players kneeling during the national anthem, protesting against racial discrimination and cops killing unarmed, nonthreatening Black youths and men, nearly always accountability. The newly adopted NFL rule illegally bans the right to legitimately protest injustice by refusing to stand on-field during the national anthem – players, coaches and other staff wishing to protest given the option to remain off-field while it’s played. Their choice is to protest publicly as the Constitution allows, not privately in locker rooms or elsewhere out of sight and mind. An NFL Players Association statement said it’ll review the new rule, “challeng(ing) any aspect” inconsistent with its collective bargaining agreement. According to the High Court ruling, the right to peaceful protests includes public flag-burning – a far stronger action than kneeling or sitting during the national anthem. “Our people are guaranteed the right to express any thought, free from government censorship,” along with having all other constitutional protections – eroding toward disappearing altogether. The NFL Players Association should contest the new rule, suing for the right of constitutionally protected free expression – no matter how politically or otherwise offensive. Loss of this most fundamental of all rights jeopardizes all others!